The name above has nothing to do with the Aran Islands perse. In Italian it means little oranges. I remember it whilst watching the first game of this years six nations rugby match, Ireland versus Italy. A game that had out hearts racing as we noted how well the Italians played. It is a paradox that the Italians have taken to rugby with such a passion, after all one associates Italy and especially Rome with the beautiful game, football. 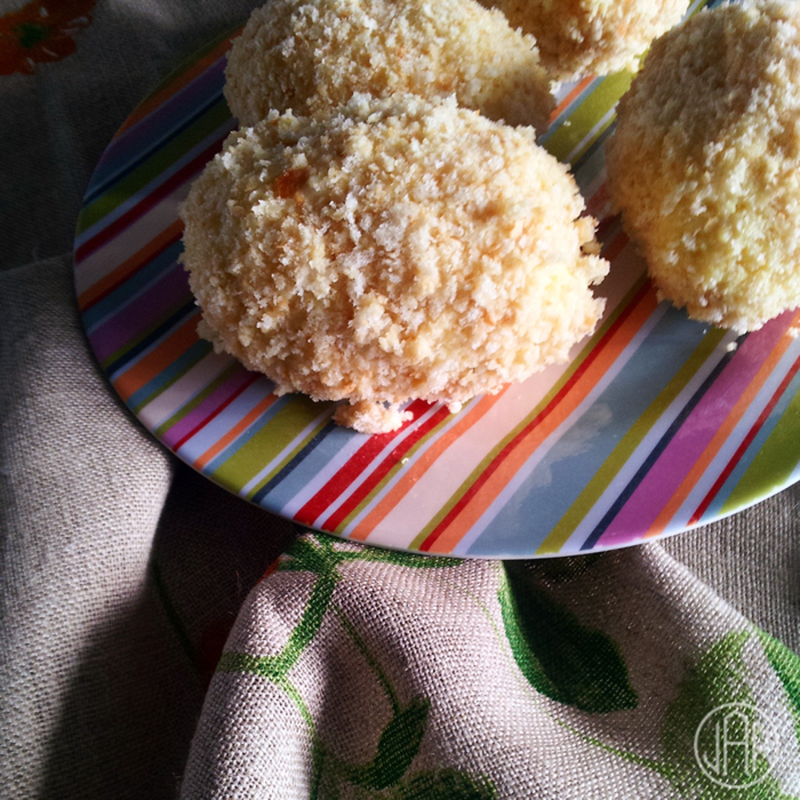 Arancini, or Suppli as the Romans call it are delicious little saffron rice balls filled with Mozzarella or Ragu. Generally it is a form of food ‘on the go’ but can also be served as a starter or made smaller as an accompaniment to pre dinner drinks. It is a great way to make use of left over rice but also making it from scratch is worth it. In a heavy skillet, put oil and butter , add onions, and cook until translucent. Add rice and stir until the entire mixture is coated. Next , add white wine and continuously over a medium heat until it is absorbed. Start to had the half a cup of chicken stock and tomato puree stirring until that is absorbed also. Continue in the manner adding stock and stirring continuously for 20 – 25 minutes until the rice is cooked but remains aldente, stirring the grated cheese and seasoning a bit of Basel if necessary. Let the risotto cool for about 8 hours. Once cooled, place flour in a shallow bowl, the eggs in another, and breadcrumbs in a third. Take a small amount of the rice in your hand creating an indention (hole) in the center. Place a piece of cheese in the center and wrap the rice around the cheese creating an oblong / egg shape. Continue to use up all the rice making the Arancini and place on grease proof paper. Take each rice bowl and first dip in the flour then add the egg mixture, and thirdly the breadcrumbs. Return to the grease proof paper and continue to coat the rest of the rice balls. 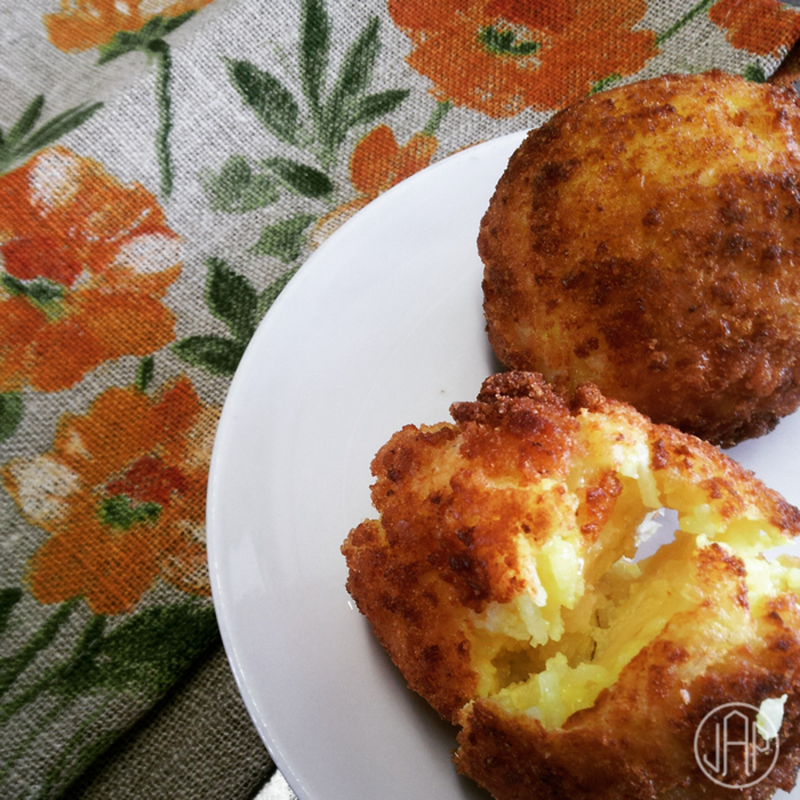 Heat the oil in a heavy saucepan and fry three or four rice balls at a time until crisp and golden brown. Remove once completely golden all over and place on a paper towel in a warm oven, gas mark 2. Continue until all the bowls are ready. Serve hot.